Here it is Friday evening and I have fallen down on the job. Time to pick up the slack and get a Champagne Friday posted. 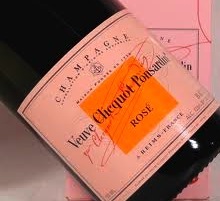 Luckily, I have just tasted – or rather drunk – a bit of Clicquot Rosé which was the cream of a nice tasting of Rosé bubbly I did today for an upcoming article on pink fizz (coming next week in time for Valentine’s day). Special thanks to Robert Gilroy (perhaps Houston’s most eligible bachelor) and the ladies in the office who helped me dispose of the evidence. A 12% alcohol blend of mostly Pinot Noir with some Pinot Meunier and a bit more Chardonnay with 12% red Pinot Noir added before the second fermentation. The wine is salmon-orange in color and fully sparkling dry, medium-bodied with freshly balanced acidity and scant phenolics. Tasted with several other Rosé bubblies, this is a richer and “foodier” Champagne Rosé with lots of rich red fruit (along with enough citrus) and a supple toasty richness (from lots of reserve wines). Still plenty fresh with a lovely feel in the mouth. Deeply satisfying. This is not aperitif Champagne; rather it is to go with salmon or steak tartar or carpaccio or even simple pasta dishes (but hold the red sauce). YUM! BS: 93+. This entry was posted in Bubbly, Champagne Friday, Uncategorized, What I'm Drinking and tagged Champagne, Rosé, Veuve Cliquot. Bookmark the permalink.